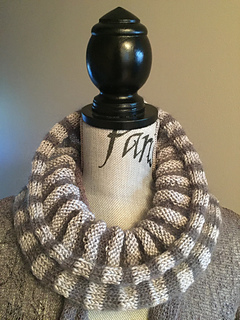 Velloso means ‘fuzzy’ in Spanish and this knitted cowl is the perfect balance of softness and fuzzy. The stripes of silky, fluffy mohair and silk blend worsted are just the right blend for warmth and softness that is light as air. 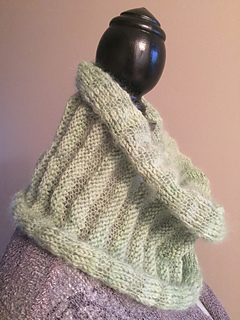 Several different wearing options and a quick and easy technique make Velloso a fun project for gifts or for you. 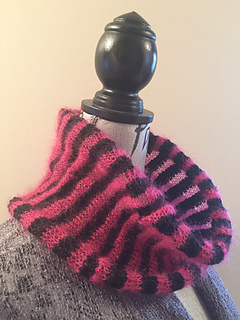 Worked in the round, the finished cowl looks seamless and is reversible with very little finishing. 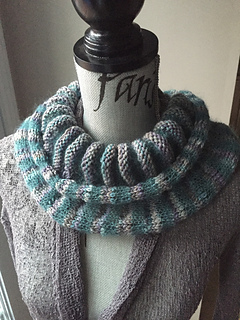 One size, though variable with different yarn selections and tension is not critical for this project. 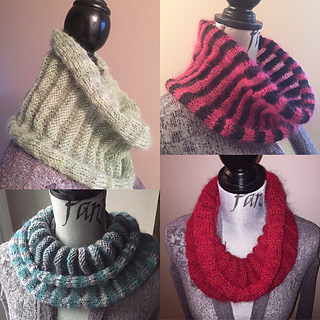 One skein each of a heavy DK to worsted and a 2-ply mohair lace will yield one and possibly two finished cowls, depending upon your tension.